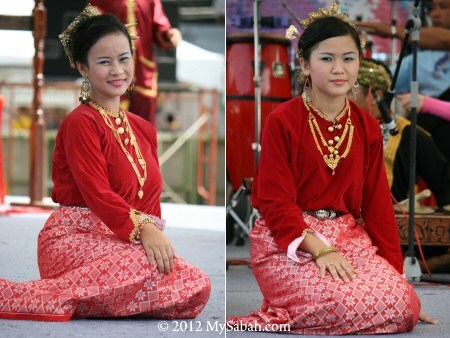 Though one of the oldest civilization of Sabah starts in Kunak, Kunak is not the most developed area of Sabah. Kunak is also where Islam first landed in Sabah, and you still can find traces of Japanese WW2 occupation around. 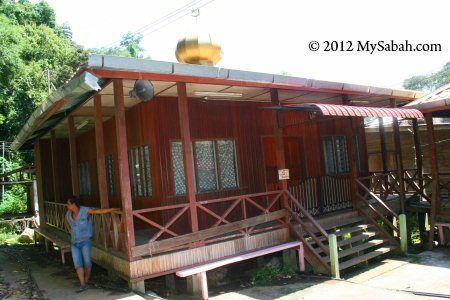 Today, Kunak is a “forgotten” town at Sabah East Coast, and nobody remember its bustling history. Pic: Islam of Sabah starts in Kunak. The locals there call Kunak the “Cowboy Town” (Pekan Koboi). Kunak is quite safe and peaceful, and doesn’t look a town of outlaw. With a population of about 50,000, most Kunakians are Bajau, Idahan and Bugis mainly working in oil palm and fishing sectors. The people here are very friendly. I don’t like standard sight-seeing tour, so Kunak is a nice town for me to see Sabah in different angle. Kunak is not a popular tourist destination of Sabah, but there are a few interesting places for you to explore. 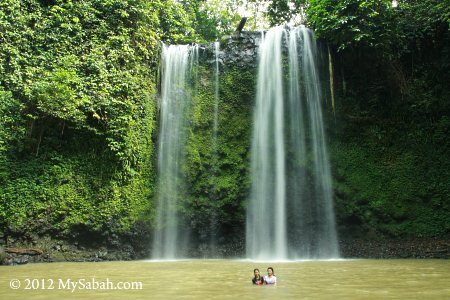 This 40-Meter waterfall is only 15 KM away from Kunak town and next to the main road. It is the favorite recreation site of the locals. 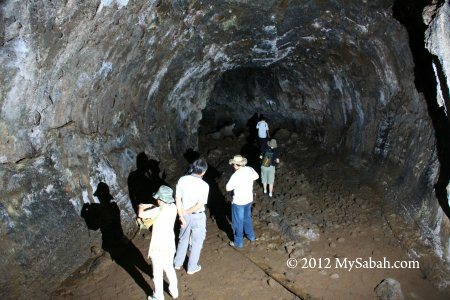 This war tunnel is a huge underground cave used by Japanese force during World War II. It is located in Mostyn oil palm plantation of Sime Darby about 12 KM away from Kunak. 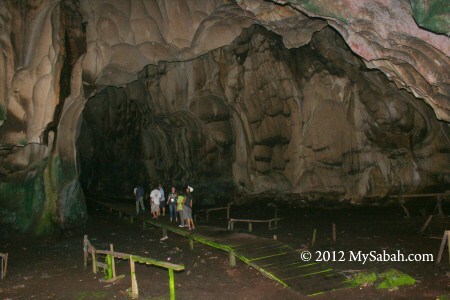 Madai Cave is the second largest cave of Sabah and situated in “Swiftlet Mountain”. This cave would be closed in Apr, Aug and Dec for bird nest harvesting by Idahan people. 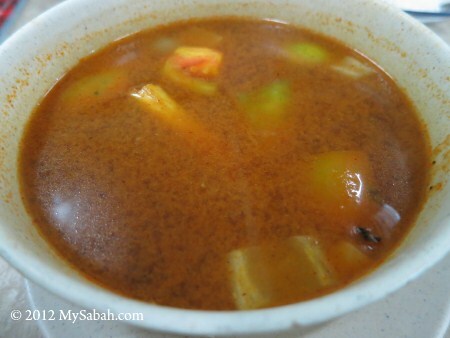 You may read my other blog about Kunak if you want to visit more attractions. 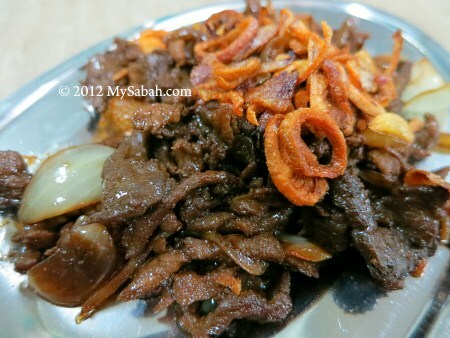 Kunak is famous for its deer meat and chili paste. 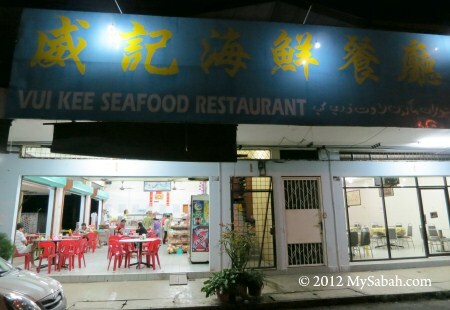 Kunak town is near to sea so its seafood is relatively fresh and cheap. 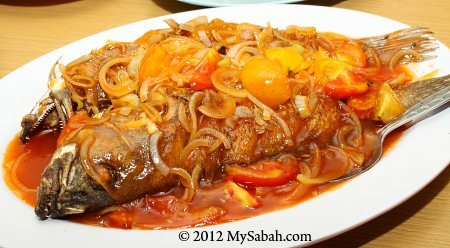 Below are a few good places for eat out in Kunak. 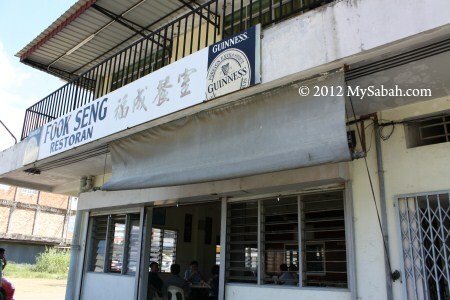 For me, Fook Seng Restaurant is the No.1 Restaurant in Kunak. 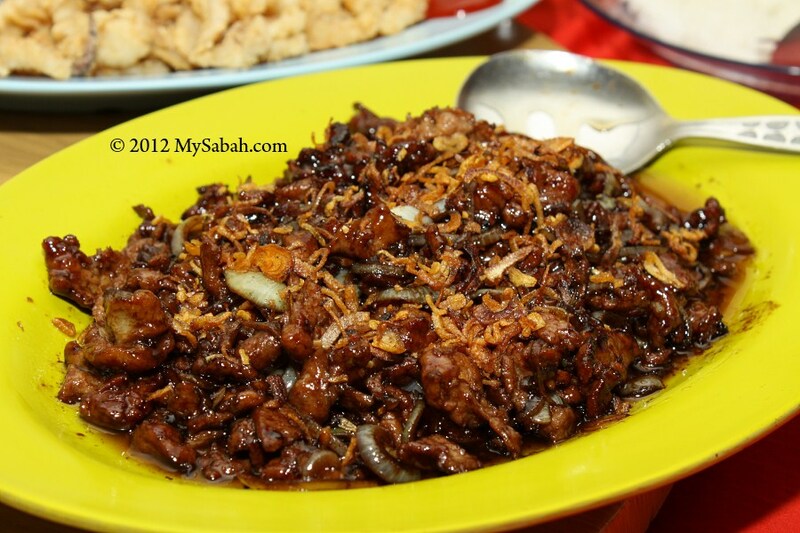 It establishes in 1970, the oldest restaurant of Kunak. The taste and variety of food there is good and they serve no pork. 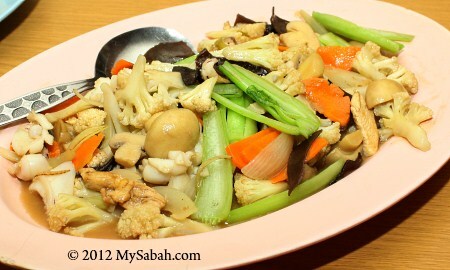 Fook Seng Restaurant is located at: Bahagian Kedai Sedco, Block C, Lot 4, 91207 Kunak, Sabah. They open from 10am to 8pm daily. Another restaurant recommended by the locals. They open from 9am to 9:30pm. The food there is quite good too. 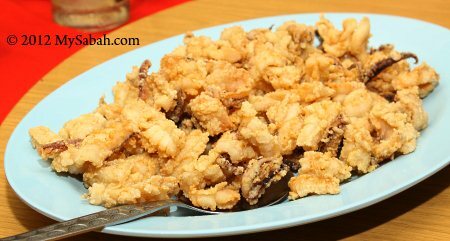 Vui Kee is about 4 KM away from Kunak town (See location map) and near (2-min walk) to Mostyn Hotel. 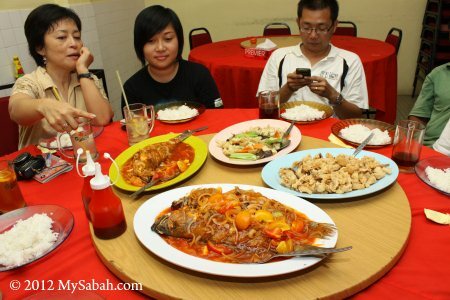 This restaurant is very near (1-min walk) to Mostyn Hotel, and they serve Halal food (Muslim-friendly). Nobody told me about this place. 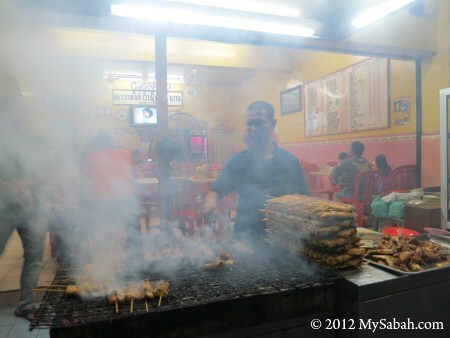 I was attracted by the smoke from their BBQ. 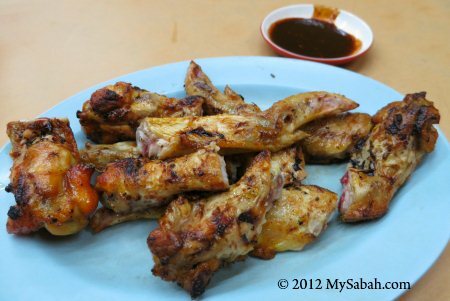 Pic: BBQ chicken wing, not bad. 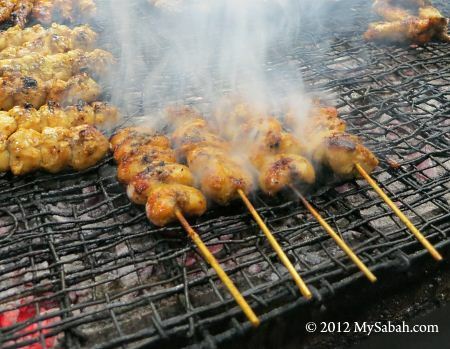 Pic: BBQ Chicken Tail, anyone? 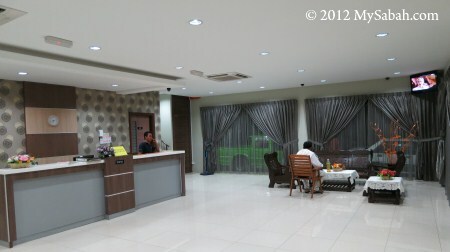 Kunak is neither a big city nor popular destination, so they have only 2 hotels. 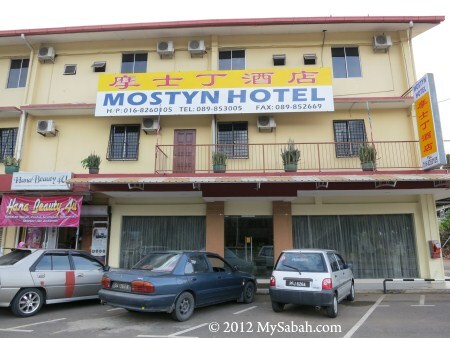 If you plan to stay in Kunak, I will recommend Mostyn Hotel at Simpang Empat (means “Fourth Junction”), which is near the roundabout 4 KM before Kunak town. 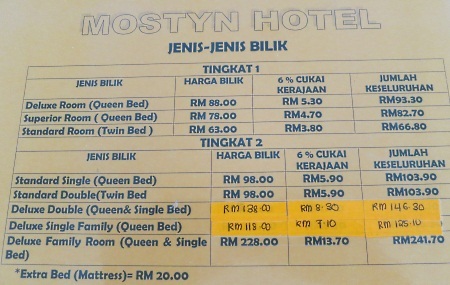 Mostyn Hotel is the most decent hotel of Kunak. The accommodation is clean and basic. Pic: reception counter. The staffs can speak basic English. I stayed in their Standard Room (Twin Bed) on 1st floor, for RM67 (≈USD22) per night. In case you can’t read Malaysian language, Tingkat = Floor, Jenis Bilik = Room Type, RM = Malaysia currency (USD1≈RM3), Harga Bilik = Room Price, Cukai Kerajaan = Government Tax, Jumlah Keseluruhan = Total Price. Upon check-in, they collect RM100 refundable deposit, so prepare more cash. 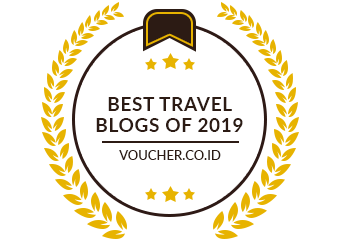 Though Mostyn Hotel is not in the town center of Kunak, its location is still quite convenient, as Vui Kee and Cita Rasa Kita restaurants are nearby. If you take long-distance bus to Kunak, you can ask the bus to drop you very near to this hotel. 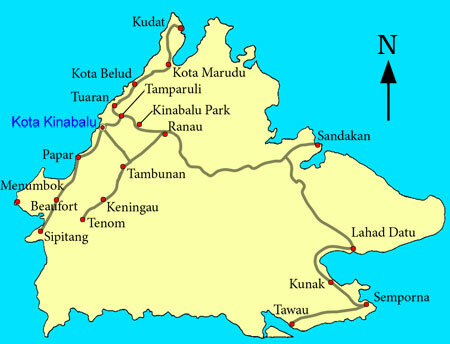 Kunak is 470 KM away from Kota Kinabalu city (KK) and located between Tawau and Lahad Datu (see Sabah map below). Normally, most travellers take a 45-min flight from KK to Tawau or Lahad Datu, then get a taxi to Kunak (Distance: 58KM from Lahad Datu, 83 KM from Tawau). 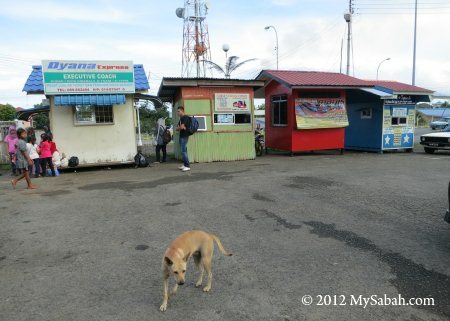 To save some money, backpackers would take long-distance bus from KK to Kunak. The bus ticket is about RM50 to RM60 (≈USD17-20) one way and the road trip takes 8 hours. Pic: bus terminal of Kunak, the bus departs as early as 8:00am. Unfortunately, there is no licensed taxi in Kunak. I rely on their unlicensed taxi (known as Kerata Sapu locally), which is readily available around town (seem like everyone can be a taxi driver there). But be warned, using unlicensed taxi is as risky as hitchhiking. It is quite ok in Kunak, but it is common sense for traveller (especially lady) to be vigilant, no matter where you travel. I requested Mostyn Hotel to get a reliable driver for me, and you can do the same. There are still a few places such as Salt-water hot spring and 7-Well Waterfall that I want to see, so I’ll visit Kunak again. 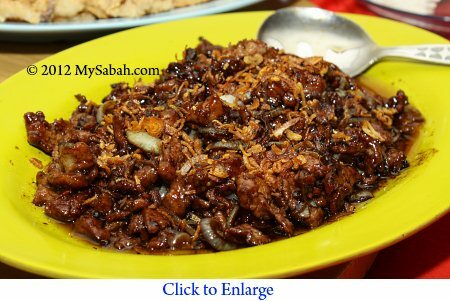 What do you think of Kunak? Does it have the potential to be a tourism destination? 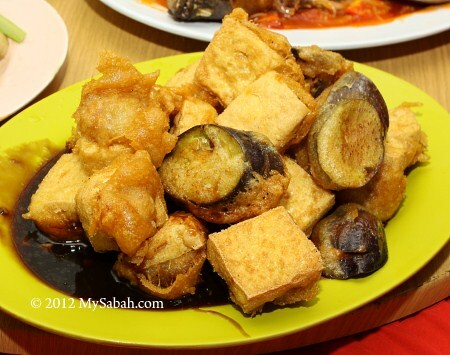 Please share with me if you know other good attractions and food in Kunak.